"I talked to the kids, really all week," head coach Andy Coen said in the run-up to this weekend's Penn game on the heels of a tough 55-17 loss to No. 10 James Madison. "We weren't thrilled with... everything... that happened in that game. We didn't put our best foot forward." "We got on the guys," he continued, "and said to them: You've got to win. You've got to make up your mind that you want to win. You have to want to start winning games." At 1-1 and the experience of a tough loss still fresh in everyone's minds, winning this weekend at home and gaining momentum going forward into the rest of the season was the theme of the week. Lehigh's 42-21 doubling up of Penn wasn't a game of perfection. But it was a devastating Mountain Hawk offensive performance, coupled with enough big plays on defense, to get a very satisfying win for the home crowd of 6,971 on hand on a sunny, somewhat humid afternoon. "I heard a statistic out there that last year, we didn't win our second game until November 1st," junior QB Nick Shafnisky said after a game where he went 18-21 passing, with 2 touchdowns on the ground and 2 touchdowns through the air, "To be 2-1, to have won two games already,.. I just want to show our fan base that this team is a lot different than last year, offensively, defensively, and collectively. Just keep going at it, keep working." Lehigh jumped up to a 7-0 lead thanks to a touchdown run from sophomore WR Gatlin Casey, but Penn would respond after the Mountain Hawks weren't able to convert on a 4th down opportunity deep in Penn territory. They'd embark on a 10 play, 95 yard drive, ending with a 5 yard scramble from QB Alek Torgersen to tie it up. It was on the subsequent drive that Lehigh, using coach Coen's words, "wanted to win the game". The Mountain Hawks 19 play, 75 yard drive had plenty of high points, including two key Shaf 3rd down conversion runs that kept the long, time-consuming drive alive and a big 4th down conversion run as well. But it was a 3rd-and-5 conversion to junior FB Kenny Crawford that really got Shaf fired up. "He had a little check burst, and then I went through the reads, I see him come open..." Shaf said, obviously still excited about it. "If he went down right away from that first tackle, we weren't getting that first down, but he broke three tackles on that play. To see that from Kenny, I got chills out there. I looked at Kenny, and I just started screaming at him. I was so hype on that play." It was a masterful drive on all accounts, concluding with Shafnisky finding sophomore WR Troy Pelletier separate from his defender to catch the first of his two touchdown grabs on the afternoon. "We responded very well to [Penn's touchdown]," Coen added later. "We came right back and answered it, and it was good to see that. I think the kids like the aggressive nature of how we're doing things. Nick's done the little things well. He's got so much more accurate and efficient with his throws, and he made a lot of good plays pulling the football." The rested Lehigh defense fed perfectly off the time-consuming drive, with junior S Brian Githens tackling Penn WR Eric Fiore in space to set up a 3rd down sack of Torgersen by senior NG Greg Palma to give Lehigh's offense the ball back. With about two minutes left in the half, after a couple of big conversion throws to junior WR Trevor Soccaras, Shaf went through his passing reads again and found a wide-open Pelletier, jumping up and down trying to get his quarterback's attention. Shaf got him the ball, and Troy was able to almost walk into the end zone with a 47 yard touchdown touchdown reception to his credit. "The corner left me, I guess," Troy said after the game. "[Shaf] was able to get out of the pocket and make a play, and I had my arms up there, jumping. We were just clicking on all cylinders on offense." The synergy continued in the second half, when a 53 yard punt by senior P Austin Devine pinned Penn deep in their territory. 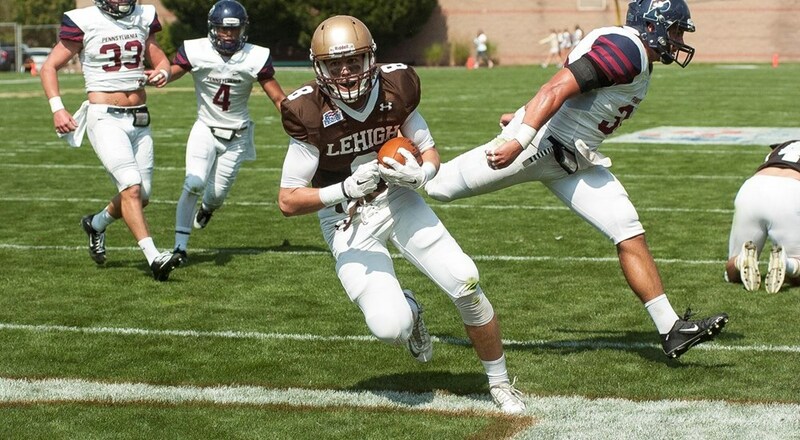 The defense forced a 3-and-out, helped by a tackle for loss by senior LB Randall Lawson, and the ensuing Penn punt only went 29 yards, setting Lehigh up on the Quaker 39 for a short drive. Behind the running of freshman RB Micco Brisker, who stepped in after freshman RB Dominck Bragalone exited the game early with a rib injury, the Lehigh offense powered forward, ending with one of Shafnisky's touchdown runs to make it 28-7. Then after a Penn touchdown, sophomore KR Marc Raye-Redmond responded with a big 57 yard kickoff return, allowing Lehigh to set up with another short drive. 6 plays later, with Shaf fading right, he would throw across his body to a wide-open senior WR Stefan Sansone in the end zone to once again go up by three scores. 35-21. "We got away from the run game last week versus JMU," Coen said afterwards, "but this style of offense needs to balanced, and we didn't have that last week. We wanted to establish it this week, with Nick of course and we started pretty well with Dom [Bragalone], who was averaging more than 4 yards a carry when he got hurt. Micco stepped right in, and got 22 for 114, which is great to see. That's not easy for a young kid, but now they've really got their feet wet, and I'm really looking forward to those guys having a great year together here." Lehigh's last score would be set up by a Githens interception, Shafnisky's second touchdown run of the afternoon. "They kept hitting that screen into the boundary and we were waiting for them to throw something off of it," Githens said. "When they did, I saw it and jumped it. I was just playing the way I was coached, flying around and just trying to make plays." "It's always great to have guys that you might not be counting on to come up and grab a role," Coen said afterwards. "Brian's able to do that. Particularly where we are with out depth in the secondary, it was vitally important that he could come in and play at the high level he's been playing at." Though not a perfect game - Lehigh would yield 336 yards passing and a couple big plays for scores - overall it was an extremely satisfying win, scoring over 40 points in a home game for the first time since a 45-24 win over Georgetown in 2013. "This week was a great win for us, especially home opener, coming out and showing our fans this team is a lot different than last year," Shaf said. "I'm excited as heck to keep it rolling." "I was telling the kids that I couldn't remember the last time we had won back-to-back games," Coen added later. "We need to get this game, and then roll into Princeton and do our best to keep it moving."